Congestion for the area from Everett to Olympia is 19 percent worse than before the recession, a new state report says. Washington state’s robust economy has brought a small increase in driving, but it’s enough to cause a staggering amount of delay on urban highways. 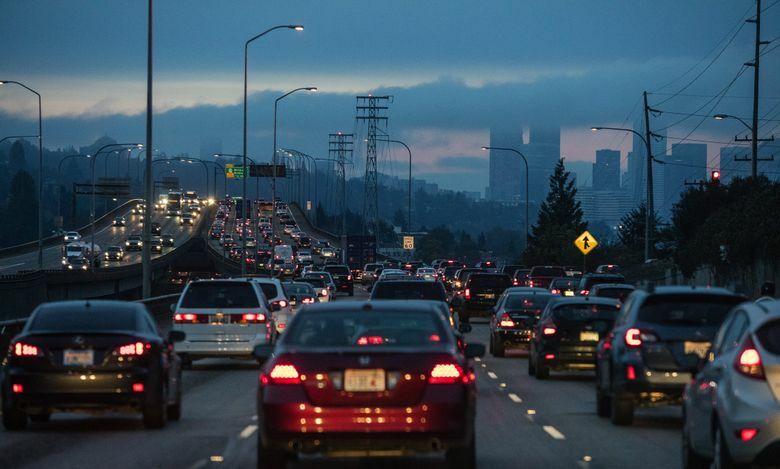 Congestion last year in the Seattle metropolitan area — from Everett to Olympia — was 19 percent worse than in 2007, before the recession hit, according to a state transportation department (WSDOT) report released Monday. Some roads are so saturated that, in many places, drivers attempt to outwit the gridlock by traveling earlier in the morning, or running errands in early afternoon. The result is that stop-and-go traffic lasts more hours a day. 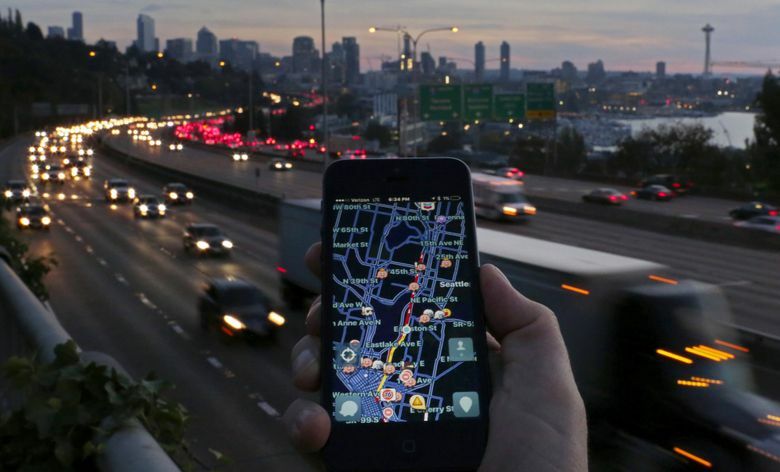 Traffic apps: Learn how they work and find one that fits your commute. For now, the environmental community’s longstanding theory about “peak driving,” where cultural shifts leave people less chained to their cars, remains a wish. Statewide, vehicle miles traveled on all roads increased by 2.6 percent over the past two years, according to the Corridor Capacity Report, as motorists covered a record 58.1 billion miles in 2014. That’s like making 312 trips to the sun and back. During that same time frame, Washington’s population rose just over 2 percent, to 7 million people, vehicle registrations grew by 7 percent, and delays in major commuter corridors increased 6.5 percent. • Going from Everett to Seattle, an average solo commute on Interstate 5 last year took 51 minutes, compared to 44 minutes in 2012. That means solo drivers must plan for a so-called “reliable time” of 85 minutes, up from 76 minutes two years before, to be assured of reaching work on time on 19 out of 20 days. Carpoolers need 74 minutes, and buses require 89 minutes to allow for stops at transit centers. The upshot is that a solo commuter between Everett and Seattle wasted an average of $3,400 worth of time and gasoline because of these delays in 2014. Such figures are based on vehicle operating costs, full wage for delivery drivers and half the average wage for other commuters. • The Federal Way to Seattle commute was almost as nasty, with a reliable time of 76 minutes, or 10 minutes more than in 2012. The average morning commute took 52 minutes at the peak. • A trip on Interstate 405 from Lynnwood to Bellevue worsened, for a reliable time of 73 minutes, compared to 66 minutes two years earlier. Average trips last year were 47 minutes. The state opened new express toll lanes on Sept. 27, providing solo drivers the chance to pay for a fast ride and skip general-lane congestion. • The report found an emerging hot spot on westbound Interstate 90 at Eastgate, which is now congested 2.2 hours a day, compared to near zero in 2012. • Delays doubled between Federal Way, Tacoma and Olympia, where military traffic, construction and sprawl create a force multiplier. The average speed on southbound Interstate 5 through Fife slipped below 36 mph on more than 90 percent of afternoons last year. • Transit absorbed some of the demand. Otherwise, I-5 would need five extra lanes to carry more than 56,000 commuters who ride buses between Everett, Seattle and Federal Way, if all those people drove alone, WSDOT says. • Despite transit growth around Seattle, single-occupancy commuting statewide remains 72 percent. • One set of commuters didn’t suffer: an average trip from Seattle to Issaquah in the afternoons took an average 22 minutes, with a reliable time of 33 minutes. That’s 1 minute less than in 2012, the only route where speeds improved. A few years ago, green-transportation supporters wondered if the state and nation were easing away from fossil fuels. Michael Sivak, a professor at the University of Michigan, has issued reports asking “Has Motorization Peaked?” He postulates that miles per driver and per vehicle peaked in 2004. Sightline Institute in Seattle published a series called “Dude, Where are My Cars?” It skewered the WSDOTforecasts that driving would sustain its late-20th century growth of 2.5 to 6.5 percent a year, an assumption the state has now abandoned. Meanwhile, traffic and revenues for British Columbia’s new toll bridges flopped compared with government forecasts. Three years ago, Sightline researcher Clark Williams-Derry wrote of a “sea change” in how Pacific Northwesterners travel. “Sure, we’re still a very car-dependent culture, and we’re likely to remain so for many years. But it may not make sense anymore — and might, in fact, be financially risky — for transportation planners to assume that demand for car travel will rise in the future the way it did in the 1950s,” he wrote. And in fact, Monday’s report from WSDOT shows highway miles per person increased only 1 percent in two years, which Mark Hallenbeck, director of the Washington State Transportation Center at the University of Washington, said is within the margin of error. But that trend is countered by a strong economy that’s putting more drivers on the road, he said, as the 7 percent jump in car registrations illustrates. For every young millennial who finds a low-car, eco-friendly lifestyle in Ballard or Capitol Hill, someone else has moved to an outerlying town like Mount Vernon, where there’s less transit and still room to drive, Hallenbeck said. He constantly tracks state data, but he said he hasn’t read Monday’s report yet. Gasoline prices nosed past $4 a gallon in 2008 but average around $2.50 right now, an inducement to drive more. The leveling off in miles per person, for several years now, remains significant long-term, Williams-Derry said. So does the moral imperative to move people without using so much gasoline, as climate change becomes an increasing problem, he said. Carbon dioxide, which contributes to global warming, has declined 2.5 percent in high-demand corridors, WSDOT report says, because of cleaner vehicles. Politicians in the Seattle area have largely placed their bets on stretching multibillion-dollar light-rail routes deep into suburbia, while asking voters to pay for more-frequent bus service. Some thinkers, such as Bryan Mistele, CEO of the INRIX traffic-data company, advocate an alternate future — clean electric, self-driving cars that use road space more efficiently. In 2008, the Legislature passed a law that set a goal of reducing the miles traveled by noncommercial vehicles 18 percent by 2020, 30 percent by 2035 and 50 percent by 2050. Such lofty aspirations appear to be disconnected from state data. Highway demand remains intense as ever. In addition, lawmakers this year approved a $9 billion program to complete, expand, extend and debt-finance state highways. In floor speeches, some of them said traffic jams on the roads to the Capitol influenced their vote for the 12-cent gas tax increase.